A bedform is a morphological feature formed by the interaction between a flow and cohesion less sediment on a bed. Ripples in sand in a flowing stream and sand dunes in deserts are both examples of bedforms, the former resulting from flow in water, the latter by airflow. The patterns of ripples and dunes are products of the action of the flow and the formation of bedforms creates distinctive layering and structures within the sediment that can be preserved in strata. Recognition of sedimentary structures generated by bedforms provides information about the strength of the current, the flow depth and the direction of sediment transport. A fluid flowing over a surface can be divided into a free stream, which is the portion of the flow unaffected by boundary effects, a boundary layer, within which the velocity starts to decrease due to friction with the bed, and a viscous sublayer,a region of reduced turbulence that is typically less than a millimetre thick. The thickness of the viscous sublayer decreases with increasing flow velocity but is independent of the flow depth. The relationship between the thickness of the viscous sublayer and the size of grains on the bed of flow defines an important property of the flow. If all the particles are contained within the viscous sublayer the surface is considered to be hydraulically smooth, and if there are particles that project up through this layer then the flow surface is hydraulically rough. As will be seen in the following sections, processes within the viscous sublayer and the effects of rough and smooth surfaces are fundamental to the formation of different bedforms. The following sections are concerned mainly with the formation of bedforms in flowing water in rivers and seas, but many of the fluid dynamic principles also apply to aeolian (wind-blown) deposits. Flow within the viscous sublayer is subject to irregularities known as turbulent sweeps, which move grains by rolling or saltation and create local clusters of grains. These clusters are only a few grains high but once they have formed they create steps or defects that influence the flow close to the bed surface. Flow can be visualised in terms of streamlines in the fluid, imaginary lines that indicate the direction of flow. Streamlines lie parallel to a flat bed or the sides of a cylindrical pipe, but where there is an irregularity such as a step in the bed caused by an accumulation of grains, the streamlines converge and there is an increased transport rate. At the top of the step, a streamline separates from the bed surface and a region of boundary layer separation forms between the flow separation point and the flow attachment point downstream. Beneath this streamline lies a region called the separation bubble or separation zone. Expansion of flow over the step results in an increase in pressure and the sediment transport rate is reduced, resulting in deposition on the lee side of the step. Current ripples are small bedforms formed by the effects of boundary layer separation on a bed of sand. The small cluster of grains grows to form the crest of a ripple and separation occurs near this point. Sand grains roll or saltate up to the crest on the upstream stoss side of the ripple. Avalanching of grains occurs down the downstream or lee side of the ripple as accumulated grains become unstable at the crest. Grains that avalanche on the lee slope tend to come to rest at an angle close to the maximum critical slope angle for sand at around 308. At the flow attachment point there are increased stresses on the bed, which result in erosion and the formation of a small scour, the trough of the ripple. A ripple migrates downstream as sand is added to the crest and accretes on the lee slope. This moves the crest and hence the separation point downstream, which in turn moves the attachment point and trough downstream as well. Scour in the trough and on the base of the stoss side supplies the sand, which moves up the gentle slope of the stoss side of the next ripple and so a whole train of ripple troughs and crests advance downstream. The sand that avalanches on the lee slope during this migration forms a series of layers at the angle of the slope. These thin, inclined layers of sand are called cross-laminae, which build up to form the sedimentary structure referred to as cross-lamination. When viewed from above current ripples show a variety of forms. They may have relatively continuous straight to sinuous crests (straight ripples or sinuous ripples) or form a pattern of unconnected arcuate forms called linguoid ripples. The relationship between the two forms appears to be related to both the duration of the flow and its velocity, with straight ripples tending to evolve into linguoid forms through time and at higher velocities. Straight and linguoid ripple crests create different patterns of cross-lamination in three dimensions. A perfectly straight ripple would generate cross-laminae that all dipped in the same direction and lay in the same plane: this is planar cross-lamination. Sinuous and linguoid ripples have lee slope surfaces that are curved, generating laminae that dip at an angle to the flow as well as downstream. As linguoid ripples migrate, curved cross-laminae are formed mainly in the trough-shaped low areas between adjacent ripple forms resulting in a pattern of trough cross-lamination. Current ripples migrate by the removal of sand from the stoss (upstream) side of the ripple and deposition on the lee side (downstream). If there is a fixed amount of sand available the ripple will migrate over the surface as a simple ripple form, with erosion in the troughs matching addition to the crests. These starved ripple forms are preserved if blanketed by mud. If the current is adding more sand particles than it is carrying away, the amount of sand deposited on the lee slope will be greater than that removed from the stoss side. There will be a net addition of sand to the ripple and it will grow as it migrates, but most importantly, the depth of scour in the trough is reduced leaving cross-laminae created by earlier migrating ripples preserved. In this way a layer of cross-laminated sand is generated. When the rate of addition of sand is high there will be no net removal of sand from the stoss side and each ripple will migrate up the stoss side of the ripple form in front. These are climbing ripples. When the addition of sediment from the current exceeds the forward movement of the ripple, deposition will occur on the stoss side as well as on the lee side. 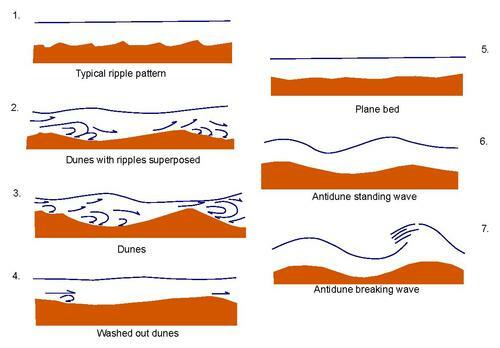 Climbing ripples are therefore indicators of rapid sedimentation as their formation depends upon the addition of sand to the flow at a rate equal to or greater than the rate of downstream migration of the ripples. The formation of current ripples requires moderate flow velocities over a hydrodynamically smooth bed. They only form in sands in which the dominant grain size is less than 0.6 mm (coarse sand grade) because bed roughness created by coarser sand creates turbulent mixing, which inhibits the small scale flow separation required for ripple formation. Because ripple formation is controlled by processes within the viscous sublayer their formation is independent of water depth and current ripples may form in waters ranging from a few centimetres to kilometres deep. This is in contrast to most other subaqueous bedforms (subaqueous dunes, wave ripples), which are water-depth dependent. Current ripples can be up to 40 mm high and the wavelengths (crest to crest or trough to trough distances) range up to 500 mm. The ratio of the wavelength to the height is typically between 10 and 40. There is some evidence of a relationship between the ripple wavelength and the grain size, approximately 1000 to 1. It is important to note the upper limit to the dimensions of current ripples and to emphasise that ripples do not ‘grow’ into larger bedforms. Beds of sand in rivers, estuaries, beaches and marine environments also have bedforms that are distinctly larger than ripples. These large bedforms are called dunes: the term ‘mega-ripples’ is also sometimes used, although this term fails to emphasise the fundamental hydrodynamic distinctions between ripple and dune bedforms. Evidence that these larger bedforms are not simply large ripples comes from measurement of the heights and wavelengths of all bedforms. The data fall into clusters which do not overlap, indicating that they form by distinct processes which are not part of a continuum. The formation of dunes can be related to large-scale turbulence within the whole flow; once again flow separation is important, occurring at the dune crest, and scouring occurs at the reattachment point in the trough. 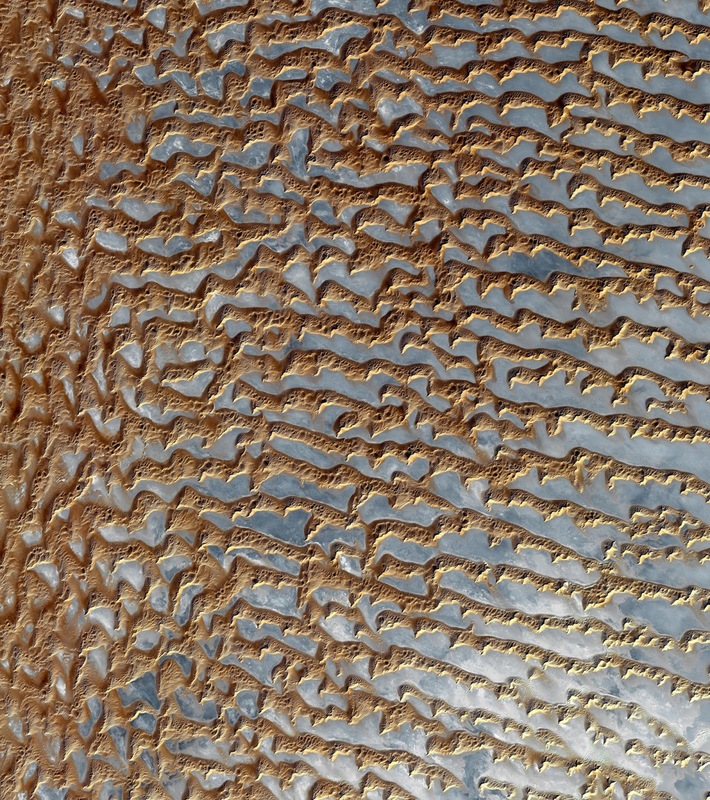 The water depth controls the scale of the turbulent eddies in the flow and this in turn controls the height and wavelength of the dunes: there is a considerable amount of scatter in the data, but generally dunes are tens of centimetres high in water depths of a few metres, but are typically metres high in the water depths measured in tens of metres. The morphology of a subaqueous dune is similar to a ripple: there is a stoss side leading up to a crest and sand avalanches down the lee slope towards a trough. Migration of a subaqueous dune results in the construction of a succession of sloping layers formed by the avalanching on the lee slope and these are referred to as cross-beds. Flow separation creates a zone in front of the lee slope in which a roller vortex with reverse flow can form. At low flow velocities these roller vortices are weakly developed and they do not rework the sand on the lee slope. The cross-beds formed simply lie at the angle of rest of the sand and as they build out into the trough the basal contact is angular. 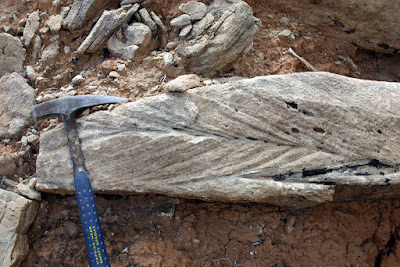 Bedforms that develop at these velocities usually have low sinuosity crests, so the three-dimensional form of the structure is similar to planar cross-lamination. This is planar cross-bedding and the surface at the bottom of the cross-beds is flat and close to horizontal because of the absence of scouring in the trough. Cross-beds bound by horizontal surfaces are sometimes referred to as tabular cross-bedding. Cross-beds may form a sharp angle at the base of the avalanche slope or may be asymptotic (tangential) to the horizontal. At high flow velocities the roller vortex is well developed creating a counter-current at the base of the slip face that may be strong enough to generate ripples (counter-flow ripples), which migrate a short distance up the toe of the lee slope. A further effect of the stronger flow is the creation of a marked scour pit at the reattachment point. The avalanche lee slope advances into this scoured trough so the bases of the cross-beds are marked by an undulating erosion surface. The crest of a subaqueous dune formed under these conditions will be highly sinuous or will have broken up into a series of linguoid dune forms. Trough cross-bedding formed by the migration of sinuous subaqueous dunes typically has asymptotic bottom contacts and an undulating lower boundary. Dunes range in size from having wavelengths of about 600 mm and heights of a few tens of millimetres to wavelengths of hundreds of metres and heights of over ten metres. The smallest are larger than the biggest ripples. Dunes can form in a range of grain sizes from fine gravels to fine sands, but they are less well developed in finer deposits and do not occur in very fine sands or silts. This grain size limitation is thought to be related to the increased suspended load in the flow if the finer grain sizes are dominant: the suspended load suppresses turbulence in the flow and flow separation does not occur. The formation of dunes also requires flow to be sustained for long enough for the structure to build up, and to form cross-bedding the dune must migrate. Dunescale cross-bedding therefore cannot be generated by short-lived flow events. Dunes are most commonly encountered in river channels, deltas, estuaries and shallow marine environments where there are relatively strong, sustained flows. Bars are bedforms occurring within channels that are of a larger scale than dunes: they have width and height dimensions of the same order of magnitude as the channel within which they are formed. Bars can be made up of sandy sediment, gravelly material or mixtures of coarse grain sizes. In a sandy channel the surfaces of bar forms are covered with subaqueous dune bedforms, which migrate over the bar surface and result in the formation of units of cross-bedded sands. A bar form deposit is therefore typically a cross-bedded sandstone as a lens-shaped body. The downstream edge of a bar can be steep and develop its own slip-face, resulting in large-scale cross-stratification in both sandstones and conglomerates. Bars in channels are classified in terms of their position within the channel (side and alternate bars at the margins, mid-channel bars in the centre and point bars on bends: and their shape. 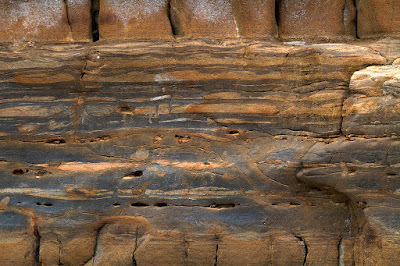 Horizontal layering in sands deposited from a flow is referred to as plane bedding in sediments and produces a sedimentary structure called planar lamination in sedimentary rocks. Current ripples only form if the grains are smaller than the thickness of the viscous sublayer: if the bed is rough, the small-scale flow separation required for ripple formation does not occur and the grains simply roll and saltate along the surface. Plane beds form in coarser sands at relatively low flow velocities (close to the threshold for movement), but as the flow speed increases dune bedforms start to be generated. The horizontal planar lamination produced under these circumstances tends to be rather poorly defined. Plane bedding is also observed at higher flow velocities in very fine- to coarse-grained sands: ripple and dune bedforms become washed out with an increase in flow speed as the formation of flow separation is suppressed at higher velocities. These plane beds produce well-defined planar lamination with laminae that are typically 5–20 grains thick. The bed surface is also marked by elongate ridges a few grain diameters high separated by furrows oriented parallel to the flow direction. This feature is referred to as primary current lineation (often abbreviated to ‘pcl’) and it is formed by sweeps within the viscous sublayer that push grains aside to form ridges a few grains high which lie parallel to the flow direction. The formation of sweeps is subdued when the bed surface is rough and primary current lineation is therefore less well defined in coarser sands. Primary current lineation is seen on the surfaces of planar beds as parallel lines of main grains which form very slight ridges, and may often be rather indistinct. Flow may be considered to be subcritical, often with a smooth water surface, or supercritical, with an uneven surface of wave crests and troughs. These flow states relate to a parameter, the Froude number (Fr), which is a relationship between the flow velocity (y) and the flow depth (h), with ‘g’ the acceleration due to gravity. The Froude number can be considered to be a ratio of the flow velocity to the velocity of a wave in the flow. When the value is less than one, the flow is subcritical and a wave can propagate upstream because it is travelling faster than the flow. If the Froude number is greater than one this indicates that the flow is too fast for a wave to propagate upstream and the flow is supercritical. In natural flows a sudden change in the height of the surface of the flow, a hydraulic jump, is seen at the transition from thin, supercritical flow to thicker, subcritical flow. Where the Froude number of a flow is close to one, standing waves may temporarily form on the surface of the water before steepening and breaking in an upstream direction. 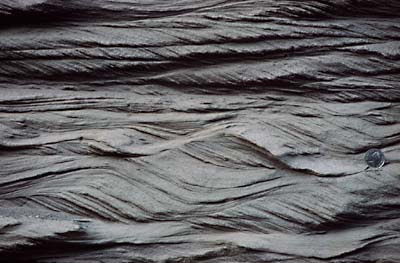 Sand on the bed develops a bedform surface parallel to the standing wave, and as the flow steepens sediment accumulates on the upstream side of the bedform. These bedforms are called antidunes, and, if preserved, antidune cross-bedding would be stratification dipping upstream. However, such preservation is rarely seen because as the wave breaks, the antidune bedform is often reworked, and as the flow velocity subsequently drops the sediment is reworked into upper stage plane beds by subcritical flow. Well-documented occurrences of antidune cross-stratification are known from pyroclastic surge deposits, where high velocity flow is accompanied by very high rates of sedimentation. The Earth is covered by 71% ocean. Most of what we know about the ocean floor was discovered after 1950, when advances in technology permitted its exploration. Therefore oceanic crust (basaltic) is composition-ally and structurally simpler than continental crust (chiefly granitic). Continental shelf – An underwater platform of continental crust at the edge of a continent. It is inclined very gently seaward at an angle of less than 1°. On the Atlantic coast of the US, the shelf is 500 km wide. On the Pacific coast, it is only a few kilometers wide. The shelf is covered with young, loose, sediment derived from the land via rivers. 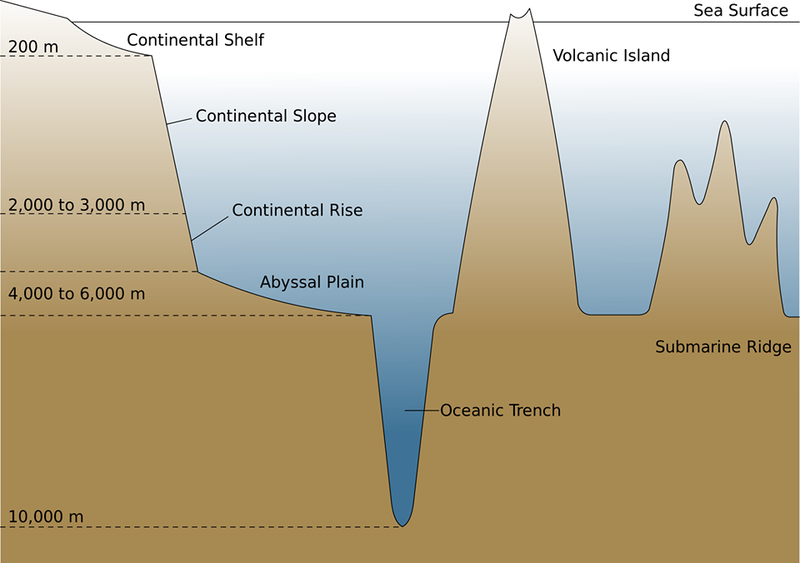 Continental slope – A relatively steep (~4-5°) slope extending from a depth of 100-200 meters at the edge of the continental shelf down to the deep ocean floor. This is where the continental crust transitions into oceanic crust. Abyssal plain – The very flat region of the deep-ocean floor, consisting of oceanic (basaltic) crust and overlying sediments. The plain starts at the base of the continental slope. The water depth is about 5 km. This is the flattest feature on the Earth (overlying sediment “fills in” the rugged volcanic oceanic crust). Submarine Canyons- V-shaped erosional canyons incised in the continental shelf and slope, and end at the abyssal plain. Sediment transported within these canyons is deposited in fan-shaped features called abyssal fans (analogous to alluvial fans on land). These underwater canyons may have initially been carved by rivers during the most recent period of glaciation when sea level was lower. Currents related to tides move up and down the canyons aiding in the transport of sediment and the erosion of the canyon. Also, turbidity currents (underwater landslides triggered by earthquakes or strong storms) contribute to the formation of these canyons. Passive continental margin- A margin that connects continental crust to oceanic crust without any tectonic boundaries. This is a geologically "quite" boundary without volcanoes, earthquakes, or young mountain belts. The main activity is sediment deposition. Passive margins include a large continental shelf, a continental slope, an abyssal plain, and a “continental rise”. Continental rise- A wedge of sediment that lies at the base of the continental slope on passive margins. It connects the continental slope to the abyssal plain, and has a gentler slope than the continental slope (~0.5°). Active continental margins are characterized by tectonic boundaries, volcanoes, earthquakes, and young mountain belts. They include a continental shelf and continental slope. The continental rise is typically absent. Instead, oceanic trenches are present. Oceanic trenches are the deepest (8-10 km) parts of the ocean. They parallel the edge of a continent and are related to a subduction zone. Trenches are characterized by earthquakes associated with the subducting slab of oceanic crust (the Benioff zone). Volcanoes are produced above the subduction zone on the continent. The continental slope occurs on the landward side of the trench. The continental slope angle changes from 4-5° on the upper part to 10-15° or more near the bottom of the trench. Mid-ocean ridges are giant undersea mountain ranges. There are 49,700 miles of mid-ocean ridges on earth. They are 930-1550 miles wide and 1.2-1.8 miles high. The crests of the mid-ocean ridges are rift valleys: normal fault-bounded, down-dropped areas where the crust is undergoing extension. They are about the size of the Grand Canyon. 4. Black smokers (sulfide minerals) and associated exotic organisms (that survive toxic chemicals, high temperatures, high hydro-static pressure, and total darkness). These organisms may give some evidence for how life first evolved on earth. Sea floor sediment varies in thickness but can be up to thousands of meters thick in spots. Terrigenous sediment – sediment derived from land that finds its way to the sea floor (via turbidity currents). a) Fine grained clay- washed to deep sea. c) Skeletons of microscopic organisms (foraminifera and radiolarian). The age of oceanic crust and seafloor sediments do not exceed 200 million years in age (~ Jurassic). In contrast, the oldest crustal rocks are 3.7 - 4.3 billion years old. The young ages reflect recycling of dense oceanic crust at subduction zones. Yet another incident evident of the Indian plate movement towards North into the Eurasia. Another earthquake struck Pakistan few minutes back (10 August,2015) . Magnitude calculation shows was 6.7 on the Richter scale while it shake most of the Pakistan. The focal point is to be in the Eskasem, Badakhshan, Afghanistan-Tajikistan border. It epicentre was 200 kilometres below surface while the surface waves was propagating about 15 seconds. This simply is the evident of the Indian plate movement while in the past couple of days, being too active. As one earthquake struck today while 7 is the count for the last past week. Its count in a month goes to 16 while 150 in year time. Crustal deformation is still active, mountains being getting higher like 7 millimetres annually. If the movement continues with this speed its far enough but what about some higher rate?. Probably it will go on a higher rate as to see the count of earthquake in this very active zone where Afghanistan, China, Pakistan, India, Nepal and Tajikistan lies. Faults being activated with intervals, different epicentres and will continue to do so. As there are many major faults in this area with to many minor faults, each the resulting force Indian plate due on the Eurasia. So as now the movement of the Indian plate is northward, will it drift the the southern parts toward North?. Surely will but the feel is not so huge as it only measures to be centimetres and not like metres. As both are large masses no one can push aside each other so it keeps mountain ranges building, old ones keep higher and higher while, the new deformation zones keep on their deformation because the force is to accommodate and later folds transform into faults and gives more earthquakes. 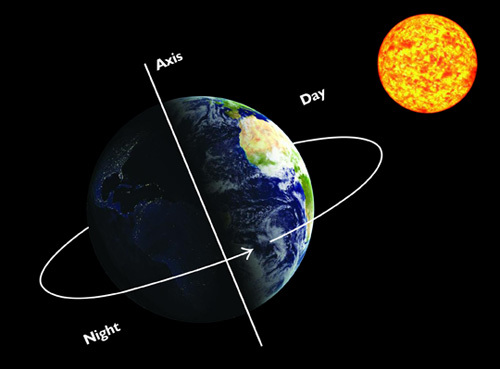 The axis of rotation of Earth is the one that determines the season of our planet. Earth axis as believed previously is the 23.5 degrees which is known from a long time but it's not any more the same as before but has shifted not gradually. There is no reason to include for the shift but evidence can provide the shift. Earth’s Axis has modified where the evidence for it is right in front of us. The season has drifted more ahead. Few years back it, the winter start was from September with intense in December but not any more. The winter now has shifted from September to November with intense in January and February and yet is dragged a lot to April and May. There will in all probability be a lot of weather over future month. Possibly more into March and April. North east is being pounded with historic levels of “Snow hurricanes”. The sun that ought to never be farther north than the tropic of Cancer in middle Mexico or farther south than the Tropic of Capricorn in middle Australia is currently considerably on the far side those points. The sun is currently regarding 2000 miles too way north within the summer shining in our northern windows and too way south within the winter shining in their southern facing windows at sunrise and sunset. The orbit round the sun had probably altered the direction of the angle observations and measurements of the abnormal position of the sun due to a big shift of our axis in Dec 2004 is currently verified. However, it's additionally considerably shifted once more within the past year for the primary time since 2004. You can measure it for yourself when you see the sun position is too far north of your home in June (northern hemisphere) when it should never be north of the Tropic of Cancer and too far south in the winter. Many people don't seem to be tuned in to true. You can look into the sun position and verify the weather changes. 1) Weathering of preexisting rocks, followed by transportation and deposition (produce clastic sedimentary rocks such as sandstones, breccias, and conglomerates). 2) Chemical precipitation of minerals from water (produce chemical sedimentary rocks such as limestone and evaporites). 3) Accumulation of biological matter such as shells and plant fragments (such as coal). Rounding of particles occurs due to abrasion during transport. Rounding increases as transport distance increases. Size sorting occurs by transport agents, especially running water. Sediment size decreases as transport distance increases. 1) Clastic (or detrital) sedimentary rocks- Form from the cementation of sediment grains that come from pre-existing rocks. This is the most common sedimentary rock type. Clastic sedimentary rocks are classified by grain size, and to a lesser extent by chemical composition. Breccia- A coarse-grained clastic rock composed of angular rock fragments cemented together (poor rounding). Breccia. © Marli Miller, University of Oregon. Conglomerate- A coarse-grained clastic rock made of rounded gravel cemented together (good rounding). Conglomerate, © Marli Miller, University of Oregon. Sandstone- A medium-grained clastic rock. Sandstone, Public Domain Image, USGS (Minerals in your World Project). Quartz sandstone - Contains >90% quartz grains. Arkose - Contains mostly feldspar and quartz grains mixed together. Graywacke - Contains sand grains surrounded by dark, fine-grained matrix (they are "dirty" sandstones). Siltstone- A fine-grained clastic rock. Siltstones have a gritty feel, and the individual grains are visible with a hand lens. Siltstone, Public Domain Image, USGS (Minerals in your World Project). Shale- A fine-grained clastic rock containing silt and clay-sided grains. Shale spits into thin layers, a behavior known as fissile. Shales feel smoother than siltstones. Shale, Public Domain Image, USGS (Minerals in your World Project). Mudstone/Claystone- Mudstone is made of silt and clay-sized grains. They are blocky (non-fissile). 2) Chemical (and biochemical) sedimentary rocks- Chemical sedimentary rocks form by the precipitation of minerals from water (this process may or may not involve the actions of organisms). In contrast to the clastic textures of the rocks discussed above, chemical sedimentary rocks have crystalline textures. Limestone- A chemical sedimentary rock composed mainly of calcite (CaCO3). Fossiliferous limestone, Public Domain Image, USGS (Minerals in your World Project). Most limestones are biochemical, but many are inorganic. They often contain easily recognizable fossils (fossiliferous). Chemical alteration of limestone in Mg-rich water can produce dolomite, CaMg(CO3)2. Chert- A hard, compact, fine-grained chemical sedimentary rock composed almost entirely of silica (SiO2). Chert, Public Domain Image, USGS (Minerals in your World Project). Chert can occur as layers or as lumpy nodules within other sedimentary rocks, especially within limestone. Some cherts are primary precipitates, but others formed by replacement of pre-existing material by silica. Evaporates- Evaporites are chemical sedimentary rocks that grow upward from seas and salt-rich lakes due to water evaporation. © Larry Fellows, Arizona Geological Survey. Common evaporite deposits are gypsum, CaSO4•2(H2O), and halite (NaCl). Organic sedimentary rocks- Fossil fuels are sedimentary rocks with a biological origin. Coal- Coal is a sedimentary rock formed from the compaction of partially decayed plant material (requires stagnant water and rapid burial). Oil and natural gas- “Cooking” below Earth's surface can change organic solids into oil and natural gas. These fossil fuels rise and accumulate in porous overlying rocks. 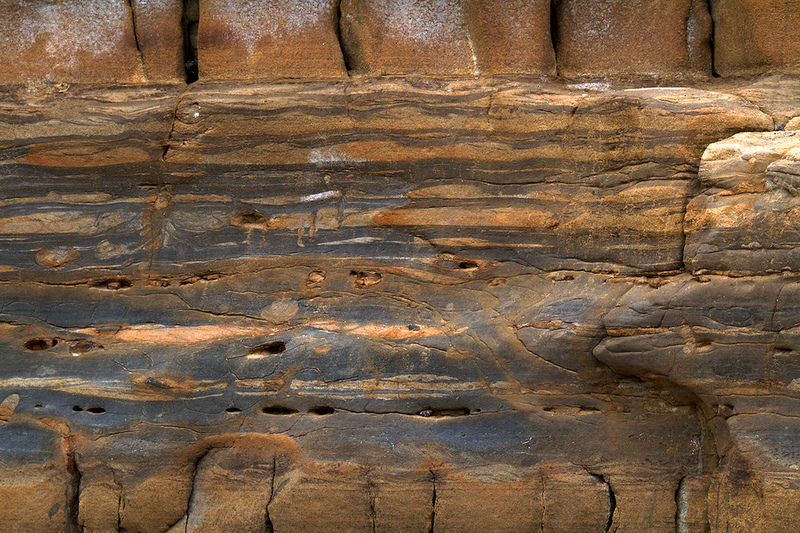 Sedimentary structure- A features within a sedimentary rock that provides clues about the environment of deposition. 1) Bedding: Series of horizontal layers within an outcrop of rock. The most common sedimentary structure. Shale with interbedded limestone. © Marli Miller, University of Oregon. 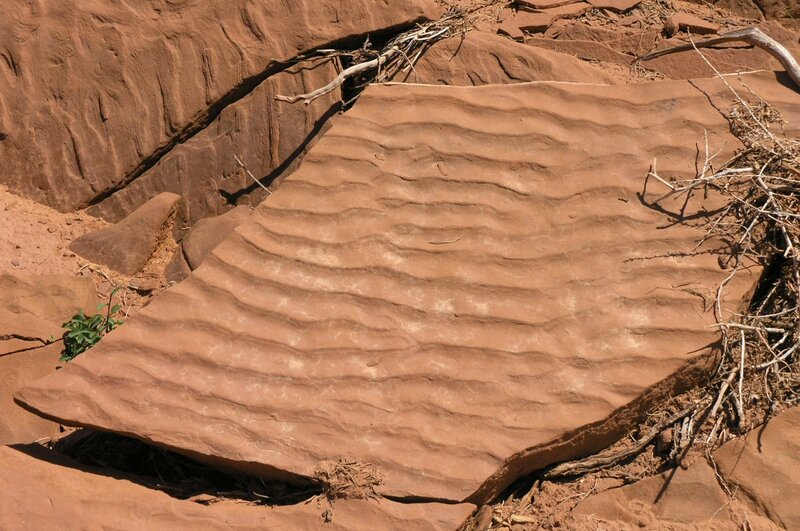 2) Ripple marks: Small ridges formed on the surface of sediment layer by moving wind or water. Symmetrical ripples represent water wave ripples, whereas assymetrical ripples represent water current or wind current ripples. 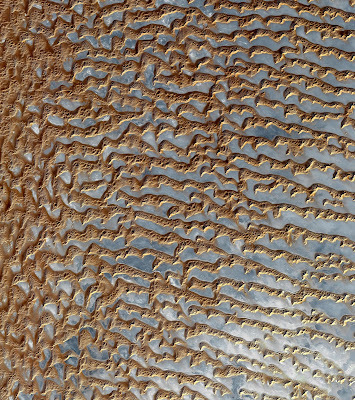 Sand dunes of Death Valley, © Marli Miller, University of Oregon. Ripples on sandy beach in southern Alaska, © Marli Miller, University of Oregon. Ripple marks on sandstone of the Triassic Chinle Formation, © Marli Miller, University of Oregon. 3) Cross-bedding- Series of thin, inclined layers within a horizontal bed of rock that represent the preservation of migrating dunes. You are looking at the side of a bed rather than the top of the bed. Cross-bedding structures in the Navajo Sandstone of Zion National Park, © Marli Miller, University of Oregon. 4) Graded bedding- A type of bedding where grain size gets smaller from bottom to top due to sorting of grains under water. This type of bedding results from underwater landslides (called turbidity currents) initiated by earthquakes. Graded bedding in matrix supported conglomerate from the Pliocene Copper Canyon formation, © Marli Miller, University of Oregon. 5) Mud Cracks/Dessication Cracks- Polygonal cracks formed in mud that dries upon exposure to air (common in dry lake beds and tidal flats). Mud cracks in the bed of the Amargosa River in California's Death Valley National Park, © Michael Collier. Ancient mudcracks (shrinkage cracks) preserved in red-brown mudstone near the base of the Watahomigi Formation, Public Domain Image, United States Geological Survey. 6) Fossils- Any evidence of past life preserved in rock. Hard parts (shells, bones) are the most easily preserved parts of organisms. Fossils can give detailed information about the environment of deposition. Animal footprints in Coconino Sandstone of Aubrey Cliffs, Arizona- Courtesy United States Geological Survey.